When the CR-Z launched in 2010, Honda proposed that the car could trace its lineage back to the beloved CR-X, a diminutive 1980s era hatch that benefited from simple design and very light weight – under one ton in some configurations – which equated to spirited performance and nimble handling combined with excellent fuel economy and a low price tag. Sporting a similar profile and the option to row your own gears, the CR-Z showed some promise. But with substantially more weight due to modern design requirements and its hybrid system, along with output that didn’t match the sportier CR-X offerings of yore, it just didn’t translate into a proper autocross champ like its older sibling was. In recent years, Honda has been attempting to recapture some of its motorsport and street performance credentials, and part of that initiative includes this extensive revision of the CR-Z by the Honda Performance Development, the arm of the company with oversees racing programs and high performance endeavors. The result is a comprehensive rework of the car’s dynamics, but ultimately, it’s an idea which may not be fully fleshed out in its execution. Yet we suspect that's not really the point of the HPD tuned CR-Z. What’s the idea behind the HPD CR-Z? It’s perhaps more honest to look at the HPD CR-Z as an engineering proof-of-concept rather than a traditional performance trim – the components used, while street legal and offered with a 3 year / 36,000 mile warranty if installed by the dealer on a new CR-Z at the time of purchase – are not sold as a package. Instead, buyers can pick and choose the parts they’d like to add to the mix a la carte. While there’s some usefulness to that, aside from some superfluous visual add-ons that amount to about a hundred bucks of the price tag, the rest of the upgrades seem so intrinsically tied together that it wouldn’t really make much sense to drop, say, $5495 on the supercharger kit and not also upgrade the clutch and differential (which are also upgrades on offer) and that’s where there’s a bit of a disconnect in terms of value. But we’ll touch on that later. Our tester was outfitted with the full complement of HPD upgrades made available for the CR-Z, which includes the aforementioned supercharger, performance exhaust, uprated suspension and brakes, 18-inch alloys wrapped in grippy Michelin Pilot Super Sport rubber, a limited slip differential, a beefed up clutch and a few aesthetic bits and pieces to compliment the newfound sportiness. 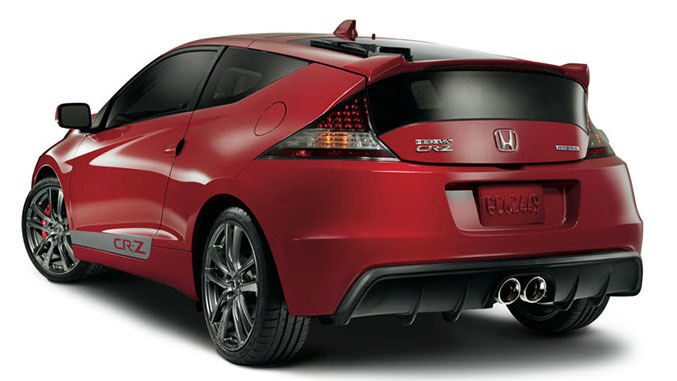 In stock form, the CR-Z has a combined output of 130 horsepower and 140 pound-feet of torque on manual equipped models. 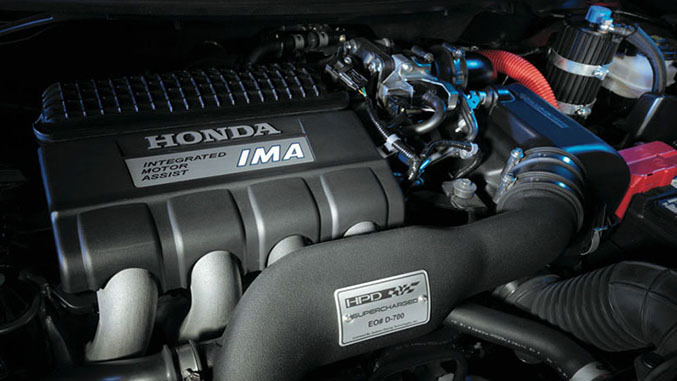 The HPD supercharger (which is only available to CR-Zs equipped with the six-speed manual gearbox) gives the CR-Z a very noticeable dose of urgency, bringing output up to 197 horsepower and 176 pound-feet of torque. On the road, that translates a reduction from the standard car’s lethargic sprint from 0-60 in 9.5 second to a much more spirited jaunt that comes in under seven seconds. It’s a dramatic improvement that, while not hair-raising amounts of thrust by current standards, is much closer in line with the CR-Z’s hot hatch lineage. Despite the big bump in power, we were surprised to find minimal levels of torque steer, and along with the HPD sport clutch, the work done by Honda’s performance division had clearly yielded a significant improvement both in terms of straight line performance as well as an overall sense of engagement behind the wheel. However, it’s worth noting we did find it slightly annoying that we couldn’t find a way to disable the car’s software from automatically shutting off the gasoline engine when the vehicle was stopped and the clutch pedal wasn’t depressed, regardless of what drive mode we set the car to. The HPD suspension kit lowers the CR-Z by 10mm, and combined with the sportier tire setup, the car stayed relatively free of push during spirited stints down the twisty swaths of tarmac on Angeles Crest Highway. The beefier suspension components seem properly tuned given the car’s performance aspirations, corralling body roll and brake dive appropriately while not delivering a ride that's not likely to be considered harsh by anyone who would opt in for these performance upgrades. 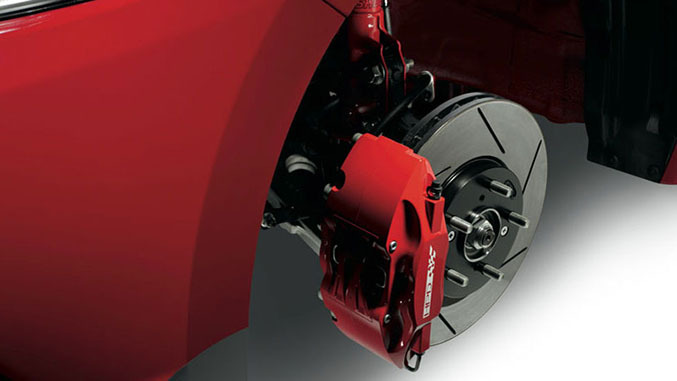 Braking also gets attention here too, and now sports a four piston monobloc calipers up with slotted discs up front, while the braking in the rear remains unchanged from the standard vehicle. With the car’s bolstered ability to get up to speed the new stoppers are a necessary inclusion in our opinion, though pedal feel still had a bit of a distant, unnatural feel to it, likely due at least in part to the hybrid’s regenerative system. In comparison to the standard CR-Z, the visual modifications are subtle rather than transformative. Some understated callouts like bigger alloys, red calipers, a rear diffuser and the performance exhaust system’s chrome tips indicate this is something beyond your typical CR-Z, but on the whole, it’s clear the overall effort here by HPD was focused around the mechanical bits. Inside we have a more or less stock CR-Z cockpit, so if you are a fan of the standard car’s interior you’ll be happy with what you see. If you are not, you're out of luck in terms of factory enhancement, though the aftermarket is always happy to oblige should you want to spruce things up a bit. Earlier we mentioned that it’s probably more appropriate to look at this HPD tuned CR-Z as a proof-of-concept rather than a sign of CR-Z models to come, and here’s why: aside from the CR-Z’s low volume sales, the full suite of HPD parts included here rings up an additional $15,374 over the standard CR-Z in EX trim, which alone comes in at $24,480 with destination and handling. And that’s without the installation costs of those HPD parts. All in, we’re well over $40,000 for this CR-Z, and any way you slice it, that’s a tough proposition given some of the other hot hatchbacks currently available in that price range. However, since the CR-Z is the first road legal car to receive parts from HPD, it’s not unlike Volvo’s Polestar S60 and V60 models in that it’s less about immediately grabbing market share in its respective segment (although how many supercharged, manual hybrid hatchbacks do we actually have to choose from?) and more of a harbinger of things to come from the company's performance division in road-going Hondas – like the sorts of things they’ll be doing to the new Civic Si and Civic Type R, the latter of which will be headed stateside this time around. Taken in that context, the HPD tuned CR-Z bodes well for Honda’s upcoming high performance road cars.